Mackerel is a rich, oily fish that stands up well to the pronounced Asian flavours in this dish. Here the mackerel is served with ginger and spring onion spiced, shiitake and tofu gyoza and finished with fresh crisp apple and garnished with apple blossom. Using a clean, damp cloth wipe the surface of the kelp, transfer into a saucepan with the water and heat uncovered. Just before the liquid comes to the boil remove and discard the kelp. Sprinkle the bonito flakes into the liquid and remove the saucepan from the heat. As soon as the bonito flakes start to sink, strain the stock and discard the bonito flakes. Reserve until required. In a pan combine the soy sauce and 100 ml of the prepared dashi stock. Add the dried mushrooms and poach until soft, about 20 minutes. Finely chop half of the mushrooms and slice the remaining half. Chop the tofu into small cubes. Grate the ginger. Finely slice the spring onions. In a bowl add 150 g of the tofu with the ginger, spring onions and the finely chopped mushrooms. Season with salt and pepper and mix until evenly incorporated. Put a spoonful of the mixture into the centre of a gyoza wrapper then fold over and pinch the edges together to make a crescent shape. Repeat with remaining mixture and wrappers. Heat the sesame oil in a frying pan, add the gyoza to the pan and colour one side. Add chicken stock then immediately cover with a lid and allow to steam for 5 minutes. Remove lid and continue to cook until the liquid has evaporated and the dumplings are cooked through with a crisp base, about 3 minutes. Place the mackerel fillets in a large pan. Pour over the remaining dashi stock and poach over a low heat until the fish is just cooked through, about 5 to 8 minutes. Remove the core from the apple and cut into fine strips (julienne). 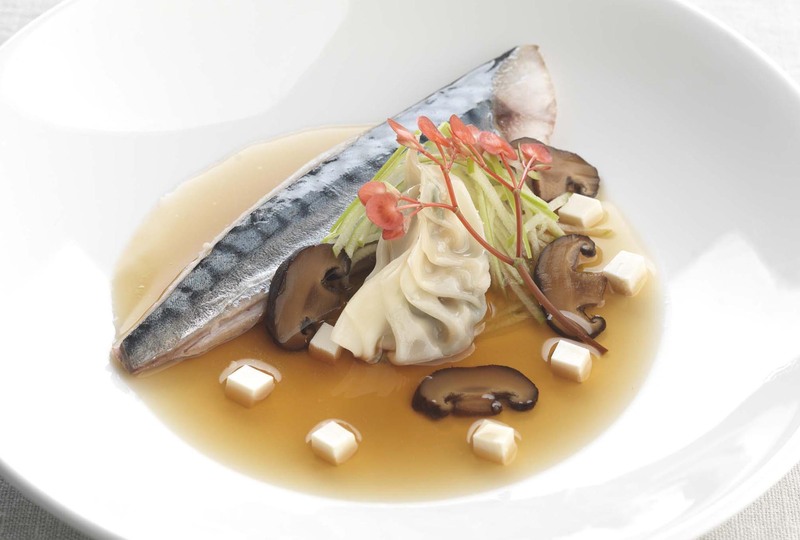 Place the mackerel fillet onto a deep plate or shallow bowl along with a small amount of the dashi broth, add one or more gyoza dumplings, then arrange the remaining tofu cubes and sliced mushrooms on the plate. Garnish with the julienne of Granny Smith apple and the apple blossom®. A very interesting Asian inspired dish, packed with very clean flavours and Umami; this fifth taste is more of a savoury holistic tactile impression than the clear cut saltiness, sourness, bitterness or sweetness. Umami tends to be very wine friendly, thus the main challenge with this recipe is the ginger. To complete the Japanese theme, one could choose a Koshu wine from the city of Koshu from the Japanese province of Yamanashi. Koshu is also incidentally the name of the grape variety that produces a very light, low alcohol, juicy, fresh wine reminiscent of rose petal and pink grapefruit. One of the best estates is Grace Vineyard and their Grace Koshu Private Reserve 2015, which would be perfect as it would help to enhance all these Umami flavours while contrasting with the unctuous texture of the mackerel and the crispness of the green apple. Alternatively, low in alcohol, cool climate white wines such as Bacchus from England, or Muller Thurgau from Germany or Northern Italy should fit the bill. Le Cordon Bleu Chefs share a delicious Christmas inspired praline and lemon Yule log recipe.